Hyperlocal marketing is growing at a rapid pace; it's evident by the number of companies that have actively started to integrate these experiences for customers. Moreover, it’s more important than ever before to build friendly and frequent connections with customers at a hyperlocal level. Do you know that 75 percent of people who search locally visit an offline store within 24 hours? That’s a pretty high chance, and we can’t ignore this statistic. It’s worth taking the foray by inviting customers to experience the city like a local. To do this, let’s clear some things up. TIP: Learn how hyperlocal sales and marketing efforts can be used in account-based marketing strategies for 2019. Hyperlocal marketing is a targeted form of digital marketing that focuses on highly targeted geographical intent. Hyperlocal search is usually aimed at individuals who are ready to purchase your services or products. 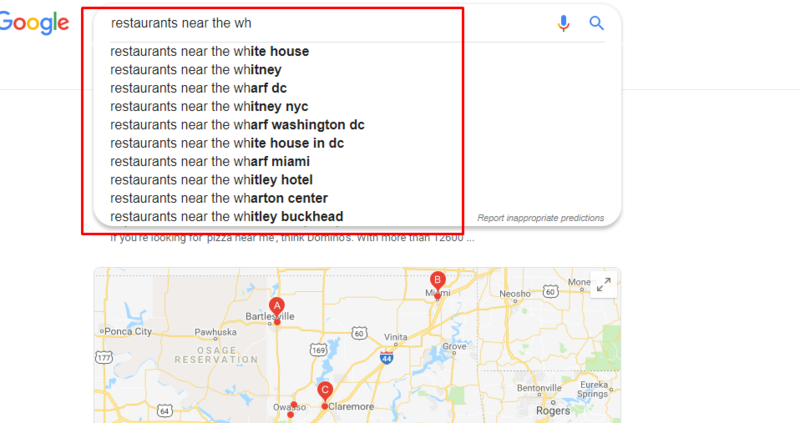 For example, the search “restaurants near Blue Hills Bank Pavilion” or a search including a specific address or post code like “restaurants near 220 Northern Ave, Boston” could be considered as hyperlocal. Instead of using general geographic information about an area, you should focus on a much smaller and more focused area. The success of hyperlocal marketing can be estimated by the growth in “near me” searchers. In fact, 28 percent of local “near me” searches result in a purchase and 50 percent of mobile users are most likely to visit a store after performing a local search. These statistics are more proof that online businesses need to use hyperlocal marketing that helps quickly increase conversions and sales. Google My Business is a free-to-use tool that allows businesses to establish an online reputation management strategy on the search engine, including Google Maps. 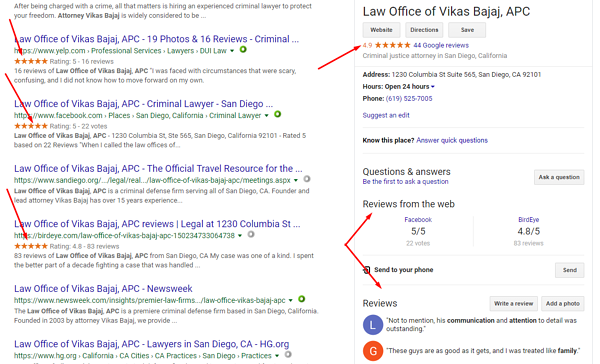 Your business will appear not only in search results on all devices, but once Google verifies your business as legitimate, it could also show on the right sidebar of Google. Google can use your My Business Page as one of the primary ranking factors to improve your local SEO. It is beneficial for any brand to make regular updates on the Google My Business account to simplify the search experience for website visitors. The higher your ranking will be the better. The first step to do it is to optimize your Google My Business Page to its full potential. Fill out every field that is intended to describe your business (a name, an exact address, working hours, logo, payment methods, contact information, and many attributes). Make sure you choose the right category and keywords and you have claimed your Google Knowledge Panel. Show visitors what your business looks like (add high-quality images). Encourage your customers to leave customer reviews online about your services or products. You can also post content within your account to tell people about current offers and events directly from search results. 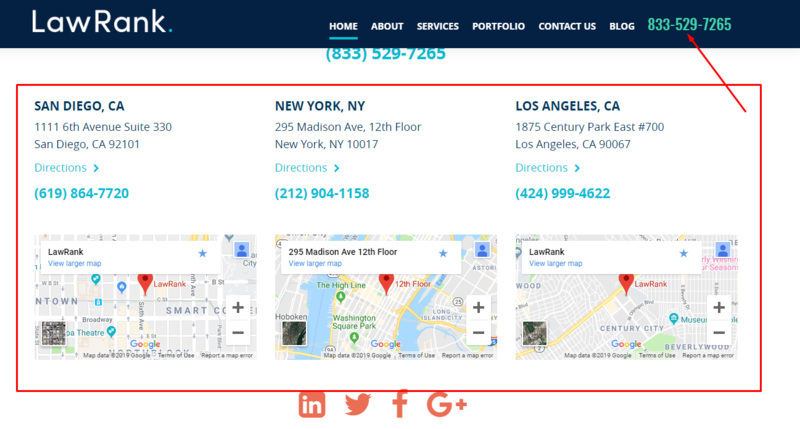 If you run a business in different locations, we recommend creating separate, optimized pages for each business location to have local representation and link them to their Google My Business pages and other profiles on the web. It seems like an obvious, but we see many sites without any contact information. If you have a local store or even more local points, include your contact details on every page of your website in the footer. Embedding a live Google Map on your web page will be the cherry on top. Whether you run a business across one or multiple locations, developing local content can interest people in a specified regional area. It takes time to create specific and authentic content that resonates with your target audience. The best way to produce the content they need is to hire local copywriters that better understand their interests, needs, prospects, and what your local community is interested in. You can create a local voice through your videos, infographics, blog posts or even email copy. 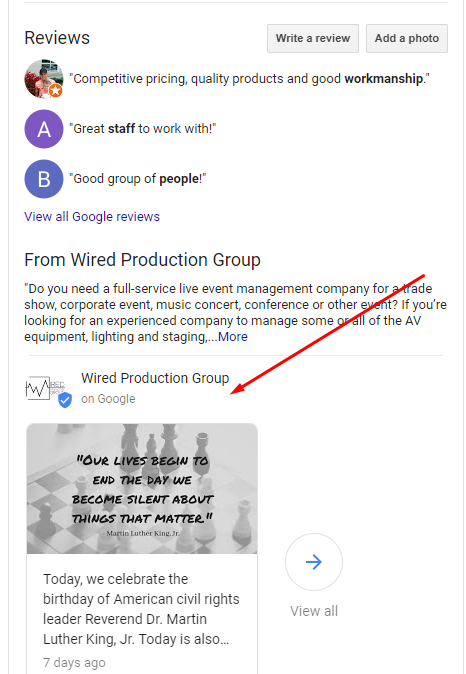 It will be a good idea to share this content on your Google My Business page and other social media channels, such as Twitter, Facebook, and LinkedIn, to make it more attractive. Your content can also focus on specific interested on a hyperlocal level, including events, points of interests, landmarks, and destinations that people might use when searching in a particular local area. 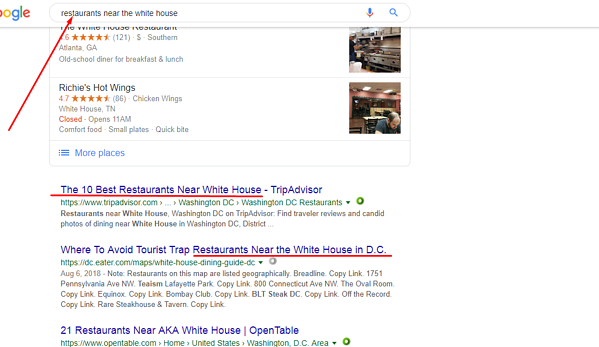 For example, if you have a restaurant in Washington, D.C., people might search for “restaurants near the Lincoln Memorial” or “restaurants near the White House.” It would be best if you focused on local things related to food lovers in your area, rather than including general information. If you manage multiple locations, make sure you run different landing pages for each location and make local-focused content. Write compelling and local-oriented meta descriptions and titles for your web pages. Optimize your images for local search. If you create content that is suited to local consumers, you will be a winner in the hyperlocal search. To help Google better understand your website and provide as much information as possible about your company, you need to implement structured data markup on your appropriate web pages. The data can help you precisely display different business attributes, such as opening hours, the exact location with latitude and longitude, phone number, business category, etc. Using structured data, it makes your web pages look better in Google search and more natural to appear for relevant queries. Note that users can filter search queries based on business hours on Google Maps and the Local 3-pack. 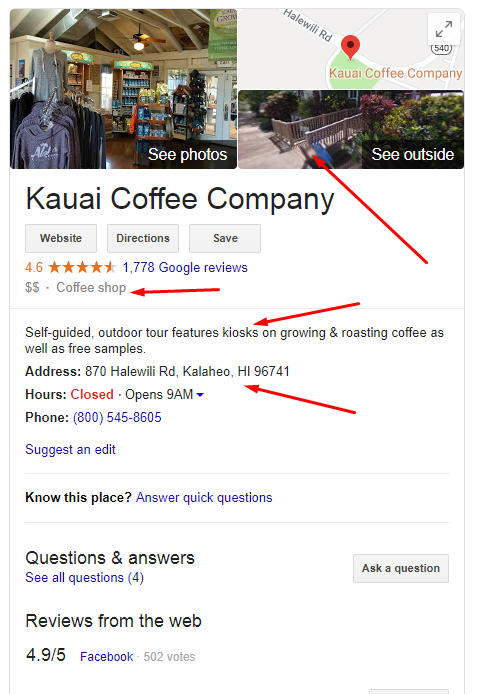 So, you can display your opening hours with markup to help Google show your business in these filtered results. 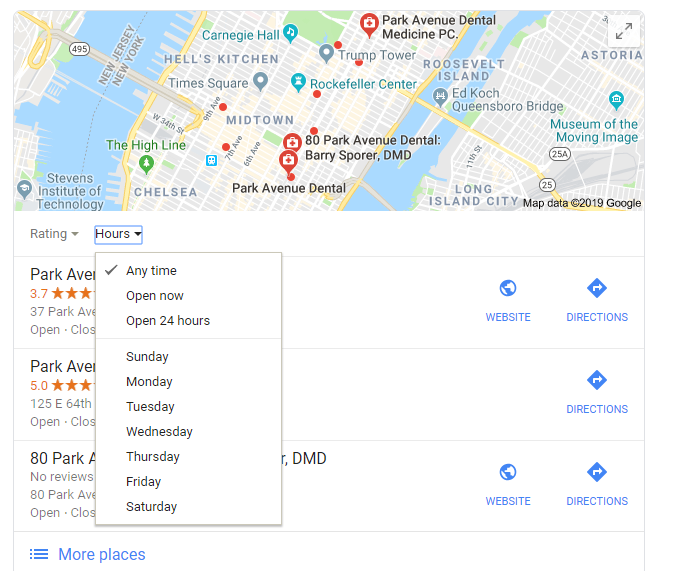 In case you manage more than one location, make sure to implement the appropriate structured data for each one to make it easier for people to find which of your businesses is closest to them. To incorporate the structured data markup on your website, you can use the Markup Helper to help Google understand your web pages more clearly. Trying to target a specific, small location with your keywords can be frustrating. We can’t reach out a high-intent local audience without hyperlocal keywords. Using neighborhood and borough-specific keywords can be a good starting point. Try to think where your business is located and what famous landmarks (museum, school, monuments, etc.) are near to you. Once you define your hyperlocal terms, it might be worth reflecting it in your onsite content. Make sure that you use these keywords in your product descriptions, company profiles, and they are naturally reflected in your titles and body text of your web pages. To help with hyperlocal keyword variations, use Google Autocomplete – which shows the most popular search terms for small local communities. 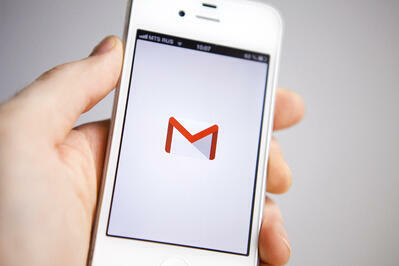 Notice that mobile devices will get different results in comparison with desktop devices. Unfortunately, it doesn’t work for Google, but it is right for Bing, Yahoo, YouTube, and Google Maps. You can also use related SERP suggestions that you can take from using keyword research and SEO tools. These tool displays keyword suggestions that are slightly varied from each other regarding similar products and services. 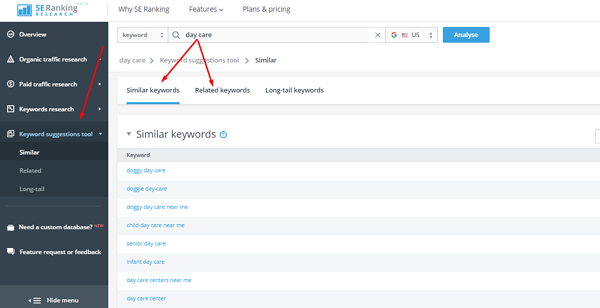 Screenshot from the keyword research tool SE Ranking. For effective hyperlocal marketing, it is vital to create a specific landing page for each location of your business. It will help you develop more localized content for customers, optimize each location, and improve your rankings. Include location-based keywords with the name of your city, town, or ZIP code. Place them in your titles and meta tags. Optimize your landing pages for each location for these keywords to attract more local traffic and rank naturally. With the release of hyperlocal advertising options such as Facebook’s Local Awareness Ads, Google Maps ads, or mobile apps, you can target any area of your choice within a certain radius, or focus your audience based on their walking distance from your location. This kind of advertising is effective and can help you become locally relevant. Target nearby customers. Select your boundary within a specified distance of your location and use the information about your existing customers to set your ad campaigns. Target audience for your event. 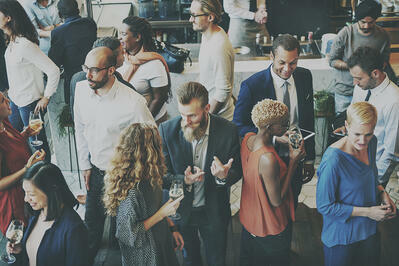 Many companies want to increase the number of people in a particular area while running an event. That will give them a strong brand positioning that can potentially attract their high-value customers. Target competitor locations. If you have competitors in your location, it will be an excellent way to get more traffic. Let people know about the benefits of shopping with you. Target travelers. These people have free time and want to fill it by shopping. Targeting places (airports, attractions, hotels, museums, etc.) that are crowded with tourists is a must. Customer feedback is an excellent way to bolster your local business reputation and increase local rankings. Before shopping in a store, online review statistics say 97 percent of people read online reviews about the business. Based on these reviews, they decide which products they want to buy. So, if you want to create a positive customer experience, encourage them to leave reviews on different online platforms. For example, you can offer a discount, free shipping, or free product – don’t limit yourself to reviews. The more positive reviews you get, the more chances your business can be found and convert new local customers. For the record, hyperlocal marketing stretches beyond the digital marketing landform. You can use some of the old strategies of advertising like billboards, flyers, signage, etc. You can also sponsor some of local sports teams, events, or host a local contest to better engage with your local customers and extend the reach of your business within your local area. If you want to boost your brand awareness, make sure to measure your success. Hyperlocal advertising allows you to be strategic with your ad spend and rely on only the most profitable marketing channels. Once you start to optimize for hyperlocal search, you need to track your progress at the local level. 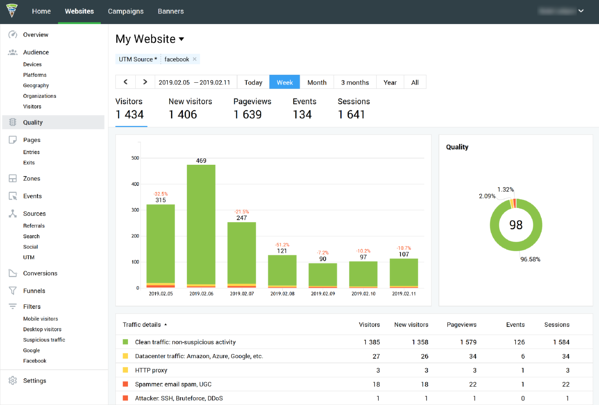 I recommend a tool for analyzing user behavior on your web pages and traffic quality from different resources, including Instagram Stories and Facebook Ads. This will help you define which sources produce desired conversion results and how your landing page is working for your location. The closer you can get to the exact location of your business, the more accurate results will be. Take a look at your local search experience of your target customers and use this data to improve your overall hyperlocal strategy. At first, hyperlocal marketing can seem small, but it can be mighty and targeted. It can help you catch exactly the consumers you are looking for, increase in-store sales and cut down advertising costs. Incorporating these 10 excellent tips with hyperlocal marketing will enhance your brand reputation within your local area and position you for greater success. Learn more about localized marketing and using it for your brand marketing strategies in 2019. 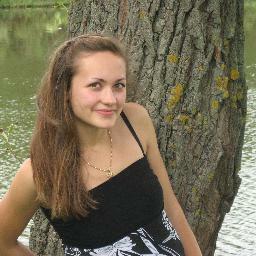 Irina is a content marketing specialist at SE Ranking, an SEO and keyword research platform.